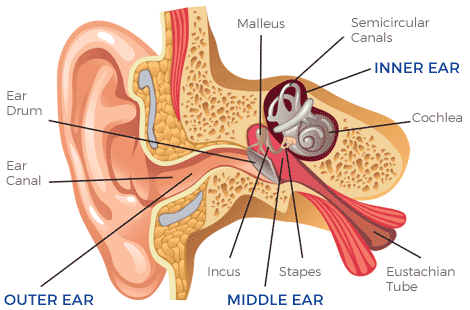 The ear is made up of three main connected parts: the outer ear, the middle ear and the inner ear. Infection is very common and can effect these individual parts separately or together. Symptoms may include earache, pain, discharge, loss of hearing, vertigo(link) or tinnitus (ringing or buzzing in the ears). If you have ear infections that don’t settle within a couple of days with simple painkillers then you should seek professional medical help. You may require ear wax removal and you may be prescribed antibiotic ear drops and/or oral antibiotics. Pain arising from the ear can be very intense. It can be related to ear infections of the ear canal or middle ear but sometimes the pain can arise from the jaw joint, the throat or even the neck. The cause of the pain is important to establish as some of the causes can be serious and require prompt assessment and treatment. Otitis externa is an infection of the skin around the outer ear normally caused by bacteria but occasionally due to fungus or yeast. It is often seen in people with pre-existing skin problems such as psoriasis or eczema and with regular swimmers (‘swimmer’s ear’). The most common symptoms include pain, swollen glands and discharge. Treatment for otitis externa is normally in the form of ear drops or sprays. If the ear is particularly swollen or blocked, you may require a gentle cleaning by microsuction. Otitis media is an infection of the middle ear that causes inflammation and build up of fluid behind the eardrum. Middle ear infections are particularly common in children and infants and normally characterised by earache, fever, hearing loss, a lack of energy or being sick. In some cases the eardrum may perforate and pus may run out of the ear causing the pain to reduce. The perforated eardrum commonly heals itself and the hearing loss normally returns after infection. Recurrent ear infection or long-lasting (chronic) ear infections are more serious. If you experience a smelly ear discharge and deafness or have other significant symptoms such as dizziness or tinnitus it may be necessary to undergo surgery to remove infection and disease from the middle ear and mastoid bone.